Every month here at Coldwell Banker Distinctive Properties Sun Valley our office participates in a community service project as part of our “Distinctive Angels” program. Giving back is a core tenet of Coldwell Banker Distinctive Properties’ mission, and our agents and office staff always look forward to our monthly team events. 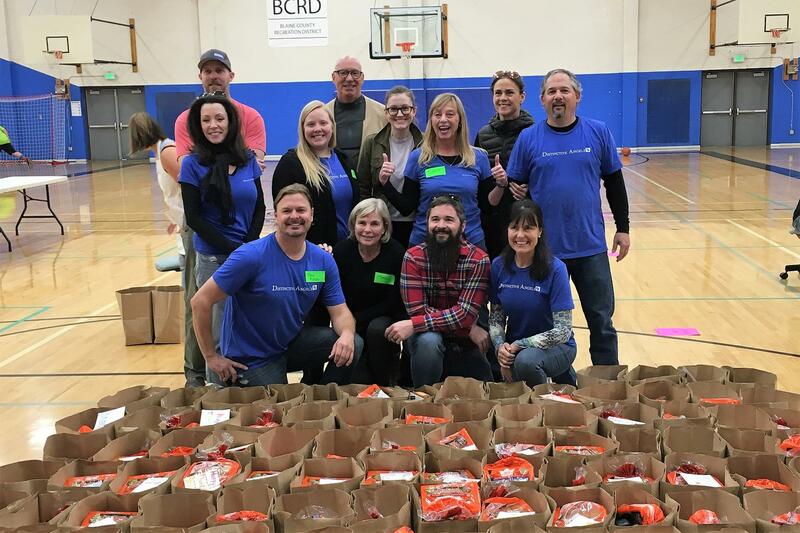 This November we partnered with The Hunger Coalition, a nonprofit located in Bellevue, Idaho, to help package Thanksgiving Food Baskets that provide families in need with all the Thanksgiving essentials, from cranberry sauce to turkeys to pies, for a holiday dinner. Our team packed baskets earlier in the week, which helped feed over 300 families in Blaine County this Thanksgiving. We had a blast and even made a cameo appearance in the November 21st edition of the Idaho Mountain Express (see below)! While a great event to participate in during the holidays, The Hunger Coalition works to tackle food insecurity issues year round in Blaine County. If you would like to support their work, all donations between now and December 31st up to $20,000 are being matched! Consider supporting an organization that we love to partner with every year.